I've mentioned a few times that CSN Stores have offered me a chance to review some of the products that they offer online. Honestly, I find their prices becoming more and more comparable to Amazon and I know for a fact that their customer service is top-notch (because I've needed to use it and they were speedy, on-the-ball, and very attentive to my needs!) I thought it was probably high time I shared what products we've selected - and loved - using. It's like magic, but you don't need to be a magician to get it to work. The PlasmaCar is a mechanical marvel that makes use of that most inexhaustible of energy sources, kid-power. It's so easy to operate; all it needs is a driver and a smooth, flat surface. For starters, it doesn't require an expensive power source that needs constant replacement. It's quiet too - the only sound you'll hear is the sound of its wheels. 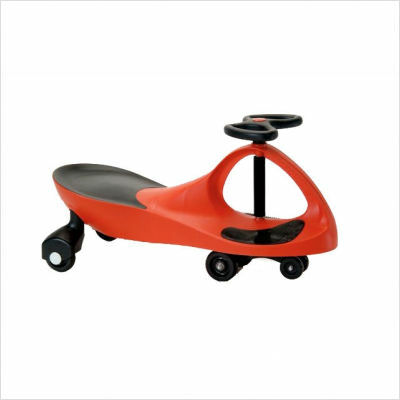 It provides kids with plenty of exercise and the PlasmaCar is engineered to be absolutely safe when used appropriately. It's been extensively tested, and meets or exceeds all significant international safety standards. (You can learn more about these on the PlasmaCar website.) It's really cool how it works - just by rotating the steering wheel from side to side. We kinda always thought we'd have a family of all boys but it's nice to know a girl is on the way! Our kid room is decorated in a western theme and I was hoping to add some girl-ish touches to it. I was really excited to find these particular crib sheets by JoJo Designs. 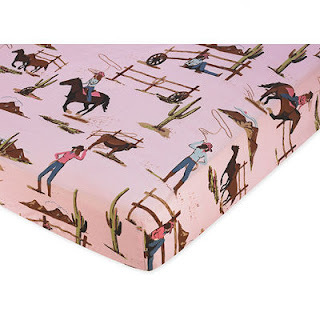 Pink retro-western cowgirls! I couldn't be more happy with them. They are now washed and tucked away, awaiting the day when we can pull them out and use them but it's very fun to have some new girl crib sheets on hand to make things a bit more special. I appreciate CSN Stores for giving me the opportunity to check out their product line, their service and the ability select things that are either useful or playful for our family. It's a great blessing. Thank you! Oh, you are so clever!! Western style room for a girl! We are SOOOOO boring when it comes to all things decorations. Since we don't find out what we're having, our daughter had a farm theme (lots of pale green) and so did our son...and future children. We did have a couple sheets that were feminine. M's room now is purple...but mostly lacking in decor...E's room has ONE picture hanging in it. Oh well. Those crib sheets are so adorable! All ready for "Cowgirl Small"!